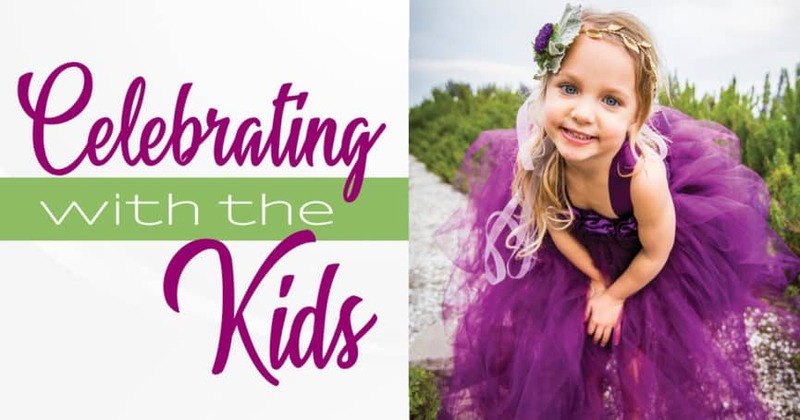 Children are the embodiment of love and joy for life, and their presence at a wedding can enrich the celebration of family and connectedness. 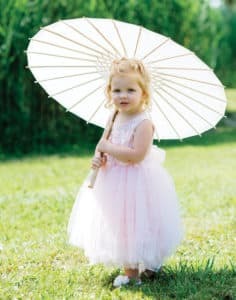 Even beyond the cherished roles as flower girls, junior bridesmaids and ring bearers, children can add so much to a dream wedding. Their freshness and genuine appreciation for time-honored rituals make them natural participants in a beautiful wedding ceremony and reception. Young ones, with their spirited spontaneity and innate sweetness, can also contribute unscripted heartwarming, or even humorous, moments that can enhance their sense of belonging and the couple’s joy in sharing with family and friends. Many couples enjoy having children participate, especially in the actual wedding ceremony. And the kids are usually thrilled to be treated as a special part of the rite. Even if the bride and groom desire children at only part of their wedding, there are numerous creative ways that the young guests can still be welcomed. It just takes some careful planning. We are all familiar with the dedicated ‘kids’ table at the reception. Time-honored and age-appropriate games and activities, of course, should be provided to keep the young ones happy and occupied. But make sure they’re extra-appealing, not messy and with no small parts. It would be a nice touch if the activity or toy could have a connection to the wedding, such as a flower coloring book that matched the bride’s flowers. Sometimes, even with a children’s table, coordinators say that there is no guarantee that some kids will not get bored or become restless. That’s why it is always a good idea to provide some form of childcare at the reception to keep the youngsters engaged rather than tugging on the adults’ legs. The babysitter’s table should be fortified with games and entertaining activities, but there should also be another sitter available to keep an eye on wanderers or cranky ones. Pre-school-age children, however, are likely to want to stay close to their parents during the reception. He continues, “We plan to do kids first, because they don’t last.” When the ceremony is at the beach, it can make the photographer’s job even tougher as children tend to be especially distracted by the waves, birds, and open spaces. 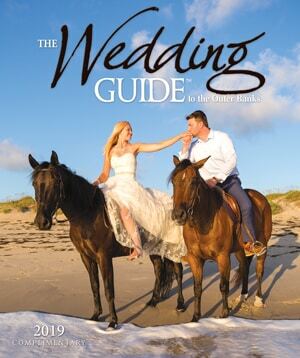 Consider using the beach as part of your prop, and photograph all the children in wedding attire putting the finishing touches on a sand castle together. When it comes to a second marriage, other needs and relationships come into play when deciding how to include children in the ceremony. Some officiants will let the children of a newly blended family sign the marriage license as a gesture. However, it’s hard to always anticipate how a child will react. Before giving children any significant roles in the ceremony, it is important to be sensitive to how they are handling the news of their parent getting re-married. 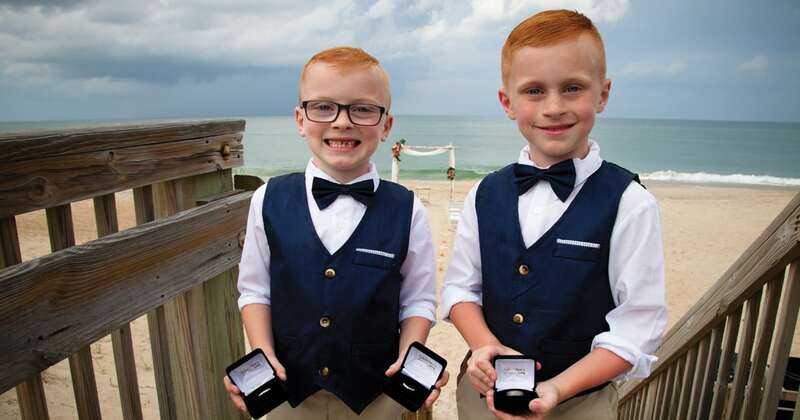 One unexpected outburst occurred when a groom’s son was asked for his “I do” during a part of the ceremony. “But you’re not my mother,” was his response picked up during the videographer’s filming of the vows. Whether it’s fun or formal roles, involving sons, daughters, nieces and nephews from both sides of the family can help them feel part of the newly extended family. Involve them in different tasks to assist at the ceremony and reception. A few rewarding jobs for children include handing out programs, assisting with the guest book, and seating guests. One creative couple appointed their youngest family members as junior photographers after the professional was finished taking her posed photographs. The bride and groom were delighted to find out later that they ended up with a few more spontaneous shots of their guests having fun at the reception – and from very different angles! 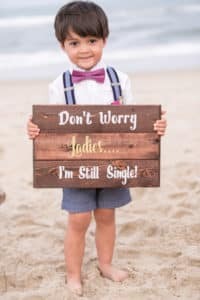 Local ministers and officiants can help you avoid the flower girl or ring bearer cliché while adding children to the blended family with sensitivity. One symbolic way to include the entire family is to expand the traditional unity candle ceremony. Instead of having only bride and groom taper candles on the altar, additional taper candles are provided to represent each child in the family. At the point where the bride and groom light the central, unity pillar with their single tapers, the children join in and all participants are lighting the same pillar with their own flame. You can also consider a unique beach version of the candle ceremony: the sand ceremony, in which each person has a vessel containing a colored sand they chose; they each take a turn to pour their sand into a single vessel as a symbolic uniting of the entire family. Again, not all children want to take part in their parents’ wedding ceremony; sensitivity dictates how much or how little they are asked to participate.